The word "shiitake" literally means "oak mushroom," so it's no surprise that red and white oaks are widely considered to be the best American trees to cut for shiitake production. But what if you live in a low and wet area with few oaks present? We've successfully fruited shiitakes on sycamores in the past (as you can see above), but with another set of plugs arriving in the middle of February, I wanted to expand our host trees. Based on about a dozen websites, here's an analysis of the best to worst eastern U.S. trees for shiitake production. Black birch --- The mushrooms in early flushes are small, but the logs improve with age. Good for Double Jewel and Native Harvest. Black gum --- Logs don't last long. In addition to species, you should consider the growth habit and location of the tree. 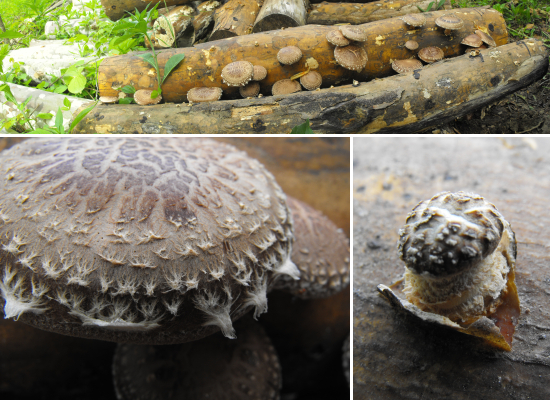 Fertile sites produce good mushroom logs, probably because the trees grow quickly and have little of the inedible-to-shiitakes heartwood and lots of sapwood instead. Similarly, rocky hillsides and wet places tend to produce logs lower in nutrients from a mushroom point of view. Mark and I need about eighteen logs for our upcoming mushroom-plugging day, and I'm thinking of trying at least three or four species from the top of this list to get an idea for which species work best here. I can definitely come up with some ironwood and beech, and maybe even an oak within carrying distance of our core homestead. Time to explore the woods with shiitakes in mind! I'm curious to know where you got the information on tree species and mushrooms. A neighbor and I have been trying to figure out which tree species would be good for both hen of the woods and chicken of the woods mushrooms, with no luck on finding the info needed. Can you recommend a website? Nayan --- I just google until I turn up enough sites that they start repeating (or contradicting) each other. You'll probably have best results if you google maitake instead of hen of the woods (or even better, their scientific names). Looking at sites that sell spawn is always a good start since certain varieties within each species require certain types of trees to grow on, and the website in question will give you that data. I should warn you, though, that neither hen of the woods nor chicken of the woods are on the easy-to-cultivate list. Any experience using Black Oak with Shiitake? Thank you. LA Romero --- I don't have any first-hand information on black oaks, but I suspect they'd be similar to the closely related red oaks.